Spider Ring Math Manipulatives = FUN! 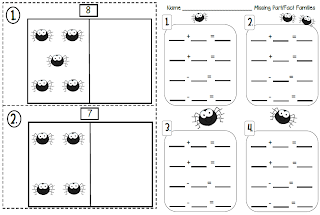 We are learning about spiders this week and I quickly came up with a little math activity to do during center time and my kids are loving it! I grabbed some spider rings at our local Dollar Store and cut off the ring part on a few of them and my students are using them as manipulatives to find the missing part. they have to write their four fact families. The super cute spider clip art came from My Cute Graphics.